Join teens from across our county, region, and state and jump into the intersection of politics and the media! Fulfill graduation requirements with fast-paced, fun, interactive learning and community service. Pre-conference gatherings in Jefferson Co. culminate in a 4-day conference in Olympia. Saturdays, Dec. 1, Jan. 5, & Feb. 2; TBA in Clallam, Kitsap, and Jefferson Counties; noon-3 p.m.
All high school students welcome! For more information, please contact tanya.barnett@wsu.edu or 360-379-5610 x208. 4-H Teen Leadership programs give adolescents the opportunity to develop advanced leadership abilities through a variety of real-life leadership roles. Everyone is welcome to participate. Club Teen Leaders High school 4-H members may enroll in the Leadership project and become teen volunteers in 4-H clubs, sharing leadership rolse with adults volunteers. 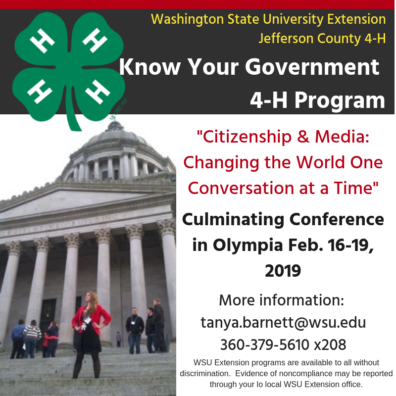 Know Your Government (KYG) is an annual 4-day teen conference in Olympia sponsored by Washington State 4-H which takes place in February. 4-H youth and their friends outside 4-H in grades 9-12 are invited to participate. Each county delegation meets five sessions in their county before the conference for training. For more information contact Tanya at tanya.barnett@wsu.edu or go to http://extension.wsu.edu/4h/youth/kyg/. SW District Teen Rally is usually held one weekend in September or October on the southern Washington coast for grades 7-12. Teens from multiple counties get together for educational workshops, special speakers and fun! For more information contact your local 4-H Coordinator.